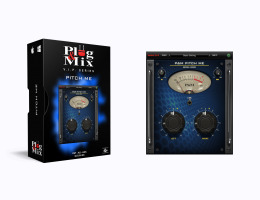 Pitch Me is your dual pitch shifter plug-in, developed with a view to the formidable H910 units of old. Independently control left and right pitch values for added width and chorus effect to your vocals and guitars and synths, just like those artists from AC/DC to Zappa. Left - Sets the pitch amount for the left channel, in cents of a semitone. Right - As above for the right channel. Link - Links both L/R knobs for setting same value amount (opposing +/-). Offset remains as you adjust. In - Controls the input level of the plug-in. Mix - Parallel dry/wet control for the effect. Note: When used as a mono instance, the signal is first split into two channels, processed and then summed back to mono.